A nine-year-old girl has died in hospital, 11 days after being hit by a van as she crossed a road. 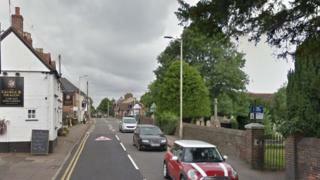 The collision involving a Volkswagen Transporter happened in High Street, Northchurch in Hertfordshire, on the evening of Wednesday, 11 October. She was taken to a hospital in London but died on Sunday night. Police appealed for the public's help to ensure their investigation was not "jeopardised by speculation, particularly on social media." Sgt Stephen Andrews from the Bedfordshire, Cambridgeshire and Hertfordshire Road Policing Unit said: "This is obviously an incredibly difficult time for the family and I'm urging members of the public to respect their privacy and to not speculate about the circumstances surrounding the collision, which could cause them further distress."